Dileep is having a dream run at the Malayalam box office with all his latest flicks reaching the audience in a grand manner. Few more interesting projects are lined up for people's favourite actor Dileep in 2013 also. His movies have been the most guaranteed movies for the producers. The upcoming new Malayalam movies of Dileep are 'Nadodi Mannan', 'Singara Velan', 'Saddam Sivan', 'Ezhu Sundara Rathrikal', 'Valayar Paramashivam', 'Manoradham' and 'Ithano Valiya Karyam'. Most of his new films are in the genre of family entertainers. Details of these movies are given below. Viji Thampi's 'Nadodi Mannan is a political satire being told in a humorous way. This will be Dileep's next movie release in 2013. In this movie Dileep essays the role of Padmarajan, a village youth coming to city due to some unprecedented circumstances. He is a man without any inclination towards politics or any political party. But he earns his livelihood by participating in protests held by different parties. His stay at Thiruvananthapuram later makes him the Mayor of the city. The movie then moves on to his attempts to clean the city. Mythili, Ananya, Archana Kavi and Sayaji Shinde are other lead actors in the movie. 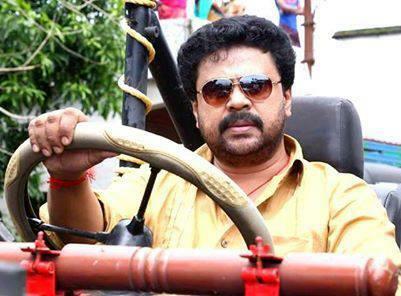 Dileep's previous outing as a political leader was 'Lion'. It was an overwhelming success for the actor. 'Nadodi Mannan' is written by Krishna Poojappura and is being produced by Chithram Films under the banner of Lal Media. 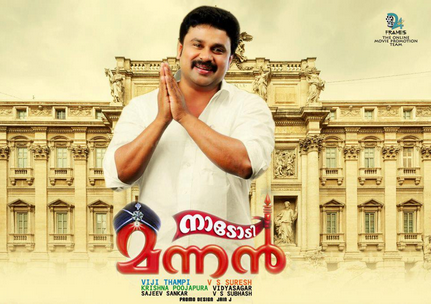 The shooting of 'Nadodi Mannan' is over and the movie will be released on 9th August as the Ramzan release of Dileep. 'Sringara Velan' will be Dilee's next movie to be released after 'Nadodi Mannan'. The shooting of 'Sringara Velan' is under progress. The movie is directed by Jose Thomas and is penned by Sibi K Thomas- Udaya Krishna team. Dileep and the script writers have a magical effect in Malayalam movies. Whenever they came up with a movie, it used to be the grand hit of that year. The same can be anticipated from 'Sringara Velan' too. The story of 'Sringara Velan' is about a young guy a young guy from a weavers' family. He does not want to be in the family business of making wedding sarees. In order to get rich he tries to marry a girl from a wealthy family based on the advices he received from his friends. His attempts fall in love with one such girl is the thread of 'Sringara Velan' and it is being portrayed in a humorous manner. Vedhika is the heroine in this flick. The movie is produced by VS Subhash. 'Sringara Mannan' will be released on next Onam occasion. Dileep will be back in action with hit maker Joshiy's 'Saddam Sivan'. This is not a sequel to 'Runway', one of Dileep's much celebrated movie. 'Saddam Sivan' is the story of a normal man, Sivan. It is his fight against social injustices and other social concerns make the subject of the movie. 'Saddam Sivan' will be penned by Vyasan Edavanakkad and produced by 4B productions. The pre-production works of this movie is on the way. Dileep will be seen with 'Classmate' team with his new project titled 'Ezhu Sundara Rathrikal'. It is directed by Lal Jose and will be scripted by James Albert. It is the story of an ad director. Some unusual incidents happening seven days before his marriage is portrayed in this movie. 'Ezhu Sundara Rathrikal' is produced by Prakash Varma and Ratheesh Ambatt. The shooting of this movie will start once Dileep completes his other works. There has been reports that Joshiy will make the sequel to Dileep's ever action film 'Runway' titled 'Valayar Paramashivam.'. Sibi K Thomas and Udaya Krishna will be writing the script of the movie and will be produced by the actor himself. Kavya Madhavan will be the female lead in this movie. 'Manoradham' is another upcoming movie of Dileep directed by R. Sukumaran. Amala Dileep will appear as a mason in the movie. There is a buzz that Amala Paul will don the role of heroine in this movie. Bu the director rejected it. 'Manoradham' will be produced by Ambakkara Films. It will be a family movie revolving around the life of a man and his wife. Dileep's character in the movie has close resemblance and manners similar to Charlie Chaplin. His wife plays an important role in the life. The best thing about 'Ithano Valya Karyam' is about the hero and heroine of the movie. Dileep and Kavya Madhavan will be romancing once again in the silver screens with this movie. 'Ithano Valaya Karyam is directed by Aku Akbar and is being penned by G S Anil. The movie is produced by Arun Ghosh and Shijoy Varghese under the banner of Chandvi Creations. Ranjith's Mammootty starring 'Kadal Kadannoru Mathukkutty' has Dileep as actor Dileep himself in a brief scene. Mohanlal is also featured in the movie as Mohanlal himself. The movie will be released soon. Anwar Rasheed's upcoming yet to be titled movie will also feature Dileep in the lead role. The movie is jointly produced by Anwar Rasheed and Amal Neerad. Screenplay is written by Benny P Nayarambalam. Dileep will be busy with the highly talked Telugu movie 'Baba Sathya Sai' in August. The actor will be doing the role of spiritual leader Sai Baba in the movie. It is about the services done by Sathya Sai during his age from 25 to 85. The high budge film is directed by Kodi Ramakrishna and is being produced by Rambabu. The movie will be later dubbed into other languages. Anusha Shetty and Jaya Prabha will be doing other key roles in the movie. Few more new films starring Dileep has been announced. These movies' shooting and other pre-production works will start only in 2014. They are Nandagopan Thirakkilanu, Comedy King, Thiruttu Rascal and Rajadhiraja. Most of these films are family entertainers exploiting the actor's ability make the audience laugh.